As a social media editor, I spend a lot of time on Instagram. I mean a lot of time—so much so that I'm afraid to even look at my iPhone screen time app for fear of shame. But, hey, it is my job, after all. Given the amount of time I spend on the app, it's safe to say I come across more than my fair share of cool looks, pieces, and Instagram shops that have me hitting the save button to add to my personal saved collection. The constant discovery does lead to quite a bit of shopping (hazard of the job), so I figured I should share the wealth and let you guys in on my recent finds. 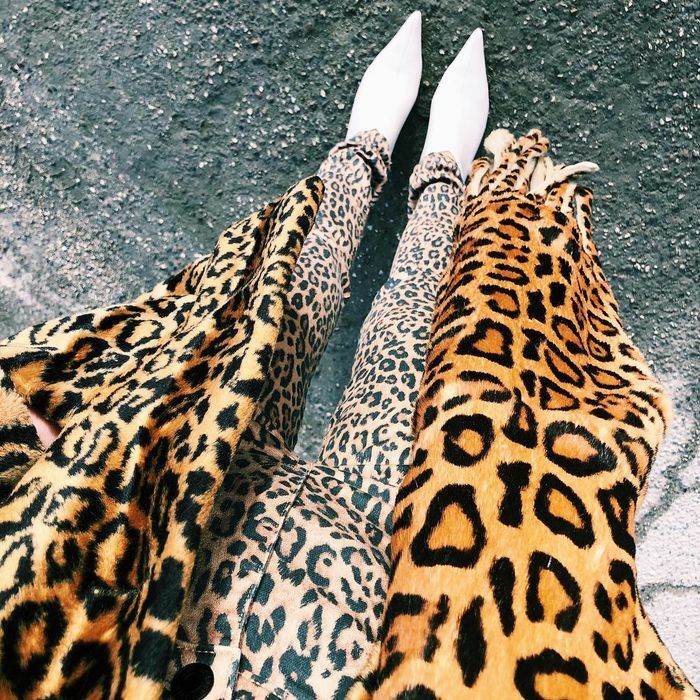 From the $20 leopard piece seen in fashion week street style to the pearl hair clips I can't stop drooling over, below you'll find the 15 best things from my feed this week. You're welcome, or I'm sorry, depending on how you look at it. Happy shopping! Pearl hair clips are trending hard on the 'gram right now. #Hairfies are the new #shoefies. These look significantly more expensive than they are. Pearls aren't just for hair in 2019.
advertisement | Like I said, almost! If these are good enough for street style at NYFW, I'm sold. An evening bag that's anything but boring. Sharing some of the things I read, watched and listened to in January over on the blog. So if you’re in need a new book or podcast to get stuck into, link is in my bio. We're still not over the cowboy boot trend, and these Paris Texas beauties feel fresh. Top-handle bags are a major 2019 trend, and this Staud number feels classic and directional at the same time. Let's all take a moment to appreciate this Chanel necklace. These are party shoes if I've ever seen some. This year is the year of the anti-skinny jean. Teddy coats are everywhere, but this reversible one wins for coziest. If I could only live in one denim brand for the rest of my life, it would be Re/Done. A pearl crop top is something I never knew I needed, but now I can't stop thinking about. Fringe + leather = my dream jacket. Last summer's It shoe just got a very glamorous makeover. Orseund Iris is the brand that has fashion girls buzzing—and this corset is just beyond cool. This '90s style tank is back and better than ever. This stone looks stunning layered with gold chains. I mean, the name of these Jimmy Choos says it all. Next up: One of our fashion editors is giving her CliffsNotes on what trends to buy right now.